I think I may have solved the puzzle of the mystery Brady Bunch object! If you don't know what I'm talking about, read my post King of the Brady Jungle. 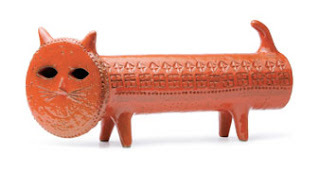 The LINE RIMINI ROSSO VENEZIANO (Cat figurine) was reissued by Flavia but is sadly now sold out. The cat's long body is hand-thrown on the wheel with other pieces, applied by hand. Embossed with the popular "Rimini" pattern covering the entire object. "Veneziano" red colour with semi-matt glaze. Red clay with refractory. I agree that yes, that has to be it!! I think it is TOTALLY cool that you were able to discover this! That is one cool cat - and I hope for you that you find one some day. Mom bought a blue Bitossi bird back in the day. I sort of hated it, until I discovered what they are worth! Wowsa! So ever since, I'd kept my eye on Bitossi's on eBay, but never saw the cat, and I also had my eye out for your Brady Bunch mystery item as I combed over the vintage auctions. Thanks Heidi Ann - I hope I do too (for a bargain price of course). 1950s - I found your post about the Bitossi bird while I was 'researching'. And this cat seems to be very popular on the blog front - I just never came across it before. I'm glad I found it, just a shame I have such expensive tastes! I used to love LOVE Art Deco. I still do, but it's a habit I will likely never be able to afford at the rate which I would like to acquire.